When we are in Italy I make sure that I get to have a gelato every single day. Dave usually has pistachio but I will try a new flavour each visit. Gelato costs in the region of €2 for both of us, which is about R26. For this we get a double scoop of whatever flavour or flavours we want. Some of the best gelato we have had has been at Gelateria Nico in Venice (Dorsoduro 992) where I had ameretto flavour. The most expensive gelato we have had has been in Bologna at the Cremaria Santo Stefano (via Santo Stefano). We went for the grande option and my choice there was cioccolato del santa (dark chocolate) and pistacchio di Bronte. This double, double scoop cost us €3.80. The most unusual gelato I have tasted was in Tropea at Tonino Gelateria where I had cipolla ice cream made from local onions. In the same village is another Gelateria, owned by the son of the owner of Tonino. Gelateria Del Borgo makes excellent flavours, and I was proposed to by the owner to please be his cucina moglie (kitchen wife) as he so loved my blog. Being a total gelato fan I could not resist visiting a local shop to try out their flavours. I was given one tiny little cup, with a not very generous scoop of average gelato. This set me back R27.90 (ouch). Deciding I could do better and cheaper at home I turned to Giorgio Locatelli for help. 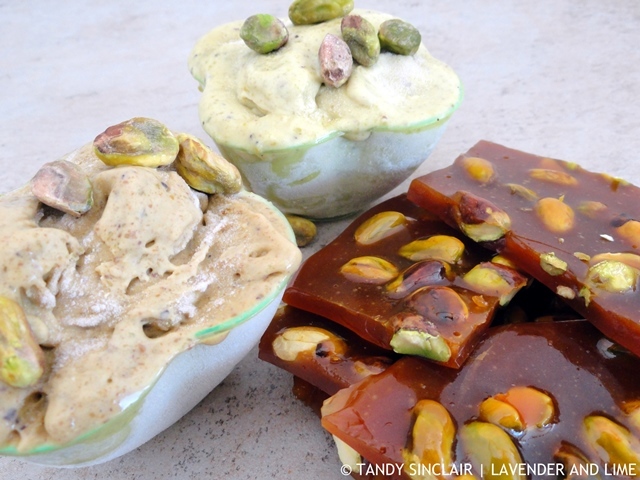 Here is a recipe for the most amazing pistachio gelato you will have anywhere outside of Italy. 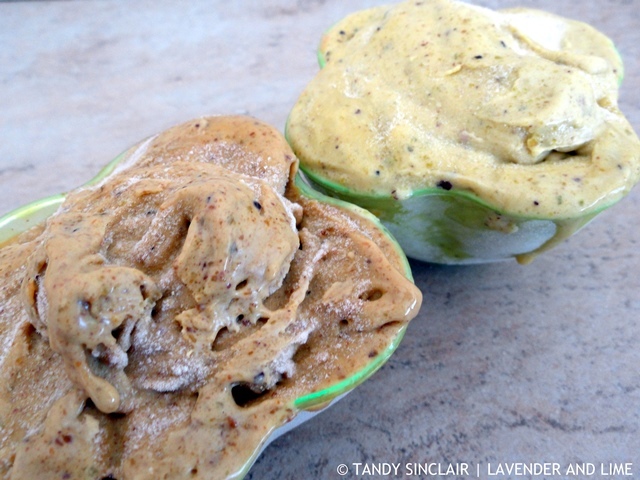 This gelato has the most amazing depth of flavour and you can choose to use either the toasted or raw pistachio paste. Love pistacio ice cream / gelati., Tandy. I’m a beginner at this home made ice cream business. All my recipes say to take out of the freezer ten minutes before serving. Is there a trick to keeping ice cream from hardening too much once in the freezer? I love pistachio everything and your gelato is just decadent! Your gelato looks delicious…thanks for sharing. Yup, this is my all favourite flavour of ice cream….. I think eating gelato every day in Florence is required. After all, they have a shop at each corner, why not! I wish I had a churner and love how delicious your recipe looks. You just gave me hope T andy :). I definitely have to try my hand at making gelato. Great recipe. Gelato is my favorite!! And pistachio is one of my favorite flavors. Love this! Ahhh!! This looks amazing Tandy!! That is so fun that you had gelato everyday! I would def do the same! 🙂 Also, my fave kind of gelato is actually sorbeto! (because I’m dairy free!) In Montreal I love to get this sorbet that is called dark chocolate honey! Seriously, it’s amazing!! This looks wonderful as well!! Chocolate sorbet is very good as well! WOW!! I love gelato and pistachios so this is a dream come true! I’ll have to try it sometime! I love pistachio ice cream so I am certain I would love the gelato too. It looks tasty. This gelato is gorgeous!! I work by the Italian neighborhood of Boston and gelato during lunch breaks is my new obsession- pistachio is a fave! I love the idea of making my own gelato as it’s not something that is easy to find where I live. I think we have one gelato shop? But I’ve never been there. And I confess…..I’ve never had gelato before, even on vacation. Pistachio sounds fabulous, should make it for my dad for father’s day as pistachio is his favorite. It’s great when something so simple (and cheap) creates a wonderful holiday memory. It’s also a souvenir that doesn’t gather dust! My Pete would LOVE this!